November 4 2018, 2:10 p.m.
On October 17, the third day of early voting in Georgia, Gabriel Velazquez was waiting in line with a friend at the only poll site open in Hall County. The two were speaking Spanish, and after a bit, a man ahead of them turned around and asked for help. Salvador told Velazquez that he had just moved from California, where there was always a bilingual poll worker to assist him, but he now realized that wouldn’t be the case in Hall County. With roughly an hour left to wait, Velazquez grabbed a sample ballot and started translating. A few minutes in, a middle-aged white woman accused him of telling the man how to vote, an odd accusation because, Velazquez assumed, the woman didn’t speak Spanish. In the booth, Velazquez flew through the translations for individual races, like the gobernador and vicegobernador, but slowed down when he came to the referendums, like the one that asks about a new homestead exemption from ad valorem taxes. Velazquez had signed an oath forbidding him from influencing the man’s vote, so when Salvador periodically asked him for guidance, Velazquez would repeat the question, clause by clause. In total, the two spent an hour in the voting booth. For the first time in Georgia’s history, there is one jurisdiction offering a bilingual ballot for the general election: Gwinnett County, roughly 30 miles south of where Velazquez was. In 1990, Gwinnett was 90 percent white, but after decades of immigration, it is now one of the most racially diverse counties in the Southeast, and by 2040, it’s projected that there will be more Hispanic residents than white. Yet, the decision to offer a Spanish-language ballot was not Gwinnett’s. Shirley Barnard, right, a poll worker at the Gwinnett County Voter Registration and Elections office, sits at the entrance for voters on Oct. 17, 2018. After the 2016 American Community Survey, run by the U.S. Census Bureau, the percentage of Hispanics reported in Gwinnett triggered Section 203 of the Voting Rights Act, the landmark federal legislation passed at the height of the civil rights movement that protects against racial discrimination in voting. Section 203 ensures that citizens of substantial language minorities can access the polls in their native language, and it currently applies to 263 jurisdictions across 29 states, predominantly for Hispanics in Texas, California, and Florida, but also in places you might not expect, like the 10 counties in Mississippi that include the Choctaw Indian Reservation. In total, almost 69 million voting-age citizens, nearly a third of the national voting-age population, live in a covered jurisdiction. As Georgia (and the rest of the nation) continues to become more diverse, Section 203 will only become more relevant — an irony considering that, at the same time, many of the other provisions of the Voting Rights Act have effectively been neutered. Since the Supreme Court’s 2013 Shelby County v. Holder decision, jurisdictions like Georgia, which couldn’t make any changes to its election administration without clearance from the federal government, have now been able to act however they see fit. A day after Georgia’s early voting started, I sat down with Andrea Young, the executive director of the American Civil Liberties Union of Georgia. With Georgia’s illustrious history of voter suppression, it was difficult to know where to start, especially considering the stakes of the race: If elected, Democratic nominee Stacey Abrams would become the nation’s first female African-American governor. Already, counties, most notably Randolph, but also Albert, Morgan, and Fayette, have been closing poll sites, predominantly in minority neighborhoods. And this year, the Republican candidate for governor, Brian Kemp, is also the secretary of state, the official who oversees the state’s elections. And create confusion they have. Over the course of two days, I spoke with roughly 50 voters outside of three polling sites across Gwinnett, and almost all had heard about one of the problems in Georgia generally or Gwinnett specifically. Of those, the majority mentioned the “exact match” system, but none fully understood what that meant. Some said it permanently removed the thousands of voters from the rolls. Others told me that their ballots would be invalidated. Reasonably so, voters expect that once they’ve registered to vote, their name will appear in the poll book. When that’s not the case, those who are informed and motivated and affluent enough can usually make themselves whole again by petitioning for a provisional ballot, requesting that a supervisor intervene, or involving a lawyer. In Gwinnett’s case, however, those least equipped to bear those burdens are most likely to have to advocate for themselves. To do so, they must confront a community that is uncertain of how or whether to embrace the diversity that’s come knocking at its doors. Lynn Ledford, the Voter Registration and Elections director, stands over absentee ballots that have been mailed to her office on Oct. 17, 2018. Board of Elections meetings typically attract few spectators, but when the meeting adjourned in Gwinnett, sitting and standing throughout the room were three-dozen people, including representatives from the Georgia Association of Latino Elected Officials, Asian Americans Advancing Justice, and the NAACP. In contrast, the members of the board, like every other county-level elected official in Gwinnett, are all white. 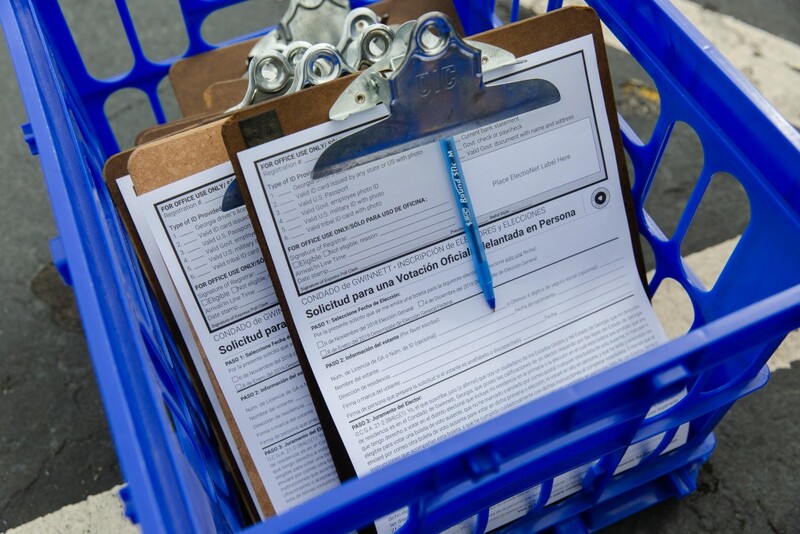 Like with “exact match,” a rejected absentee ballot isn’t inherently fatal. The status of every absentee is publicly available on the secretary of state’s website, and in theory, the county notifies affected voters, who can then re-cast their ballots or vote in person. However, the board refused to say when it would notify those affected, many of whom are elderly, disabled, or immigrants. Hispanics have been rejected at almost twice the rate of white voters; African-Americans, more than three times the rate; and Asians, nearly six. Though Gwinnett accounts for 12 percent of the state’s absentee ballots, it has been responsible for 40 percent of absentee rejections. At the meeting’s start, the chair announced that because of the lawsuit, the board couldn’t discuss the absentee ballots, which satisfied no one. “I’m appalled at what Gwinnett County is doing,” said Penny Poole, the president of the local chapter of the NAACP. “I’m appalled that we have to be in this room. I’m appalled that you guys sit up there and smile at us like you’re our friends when you have the right, as a county, to choose how these things are handled.” When she finished, the room applauded. “Our hands are somewhat tied by what the law says we can and cannot do,” the board chair told Poole. As he continued, Poole interrupted — “That’s not true.” Eight days later, a federal judge issued a temporary restraining order prohibiting officials in Georgia from rejecting absentee ballots or applications without giving voters an opportunity to contest. On Friday, the 11th Circuit Court of Appeals concurred. The day after the Board of Elections’ meeting, I got a tour of its headquarters, a repurposed Walmart that, for the first week of early voting, was the only polling site for the county’s 521,492 registered voters. I met with Lynn Ledford, the Voter Registration and Elections director, who started working at the board as a temporary employee in 1987. By 1990, there were 8,470 Hispanics total in Gwinnett. Today, there are over 40,000 registered to vote. Ledford showed me the county’s Spanish-language material, not just the ballot and registration forms, but every external document the board produces, including a bilingual, peach-centric voting sticker. To make the transition, she said the county received no guidance on Section 203 compliance from the state government. They also had to foot the $1 million bill themselves, though Ledford said that the Board of Commissioners essentially provided a blank check, an unusually plush situation for election administrators (by comparison, New York City’s BOE has been asking for more money for its poll workers since 2010). However, these additional resources haven’t led to what is arguably the most important provision of Section 203 coverage: bilingual poll workers. At the BOE meeting, Ledford reported that they’d hired 60 to 90 temporary workers, well below her initial goal of 350 and a range that’s so large because many poll workers, hired as one-day temporary employees, fail to show on Election Day. Ledford freely admits that the Spanish she knows is largely confined to counting to 10, which she learned as a kid watching “Sesame Street.” However, running elections is an exhausting, thankless task that requires a multitude of skills, and being bilingual, even in a county as diverse as Gwinnett, isn’t necessarily a requisite — as long as you can connect with the necessary communities. And in that regard, Ledford has come up short. Jerry Gonzalez, executive director of the Georgia Association of Latino Elected Officials, on Oct. 17, 2018. Voters arrive for early voting at the Gwinnett County Voter Registration and Elections office on Oct. 17, 2018. When talking about suppressed votes, the easy assumption is that they’re exclusively Democrats. That’s generally the case in parts of Atlanta, but the reality in Gwinnett is more complicated. The county has a significant Cuban population, which tends to lean more conservative, and, especially on social issues, Latinx voters are not uniformly liberal. According to Mike Seigle, the chair of the Gwinnett County Republican Party, the immigrants moving into the area now tend to be more affluent than the waves before them, and Asian voters, especially older ones from Communist nations, generally vote Republican. For his part, Seigle says he’s proud of the diversity in Gwinnett and supports the Spanish-language ballot. Likewise, it’s easy to believe that a county accused of racial profiling (and currently being sued for allegedly drawing its county-level election districts in order to dilute the influence of minority voters) is uniformly against immigrants. But, the day after Velazquez had to translate the ballot in Hall County, a middle school in Gwinnett was translating its PTA meeting from English to Spanish. Valentine has made a compelling case for how bilingualism benefits Gwinnett’s bottom line, which is perhaps why the county has embraced Spanish in schools more so than on the ballot. For both, though, the goal is the same: to help immigrants integrate by meeting them halfway. Doing so requires time and resources, which is why the most common argument I heard against Section 203 coverage — if you’re a citizen, you should speak English — is so hard to swallow. Downtown Norcross, in Gwinnett County, Ga., on Oct. 17, 2018. And so far, those party invitations have not been extended freely. In DeKalb County, which borders Gwinnett to the southwest and voted for Hillary Clinton by a 63-point margin in 2016, officials admitted that 4,700 applications to vote by mail have been lost. In Louisville, southeast of Atlanta, about 40 black senior citizens were ordered off a bus that was taking them to vote early. Across the state, newly naturalized voters who provided proof of citizenship when they registered to vote were told that they would have to do so again before a deputy registrar. On Friday, a federal judge called that requirement a “severe burden” and cleared the citizens to vote without the additional verification. Technically, these incidents didn’t disenfranchise anyone, but they do demand that citizens know their rights, assert them when necessary, and persevere until their vote is counted. However, that last point is also no guarantee. Georgia is one of five states in which every county uses electronic voting machines that leave no paper trail, and already, the state chapter of the NAACP has sued the secretary of state’s office for irregularities. Partly to ensure physical proof of their votes, many black citizens participated in a church-led vote-by-mail campaign this year, but, especially in highly segregated Atlanta, anyone who wanted to disenfranchise voters of color could do so, quite reliably, based on their ZIP codes. And, should a candidate ask for a statewide recount after November 6, that petition would fall before the secretary of state. In Gwinnett, not everyone is thrilled with the Spanish-language ballot, which Ledford recognizes. She instituted cultural sensitivity training as part of this year’s poll worker curriculum, but it remains to be seen how much an online course can combat deeply ingrained beliefs. 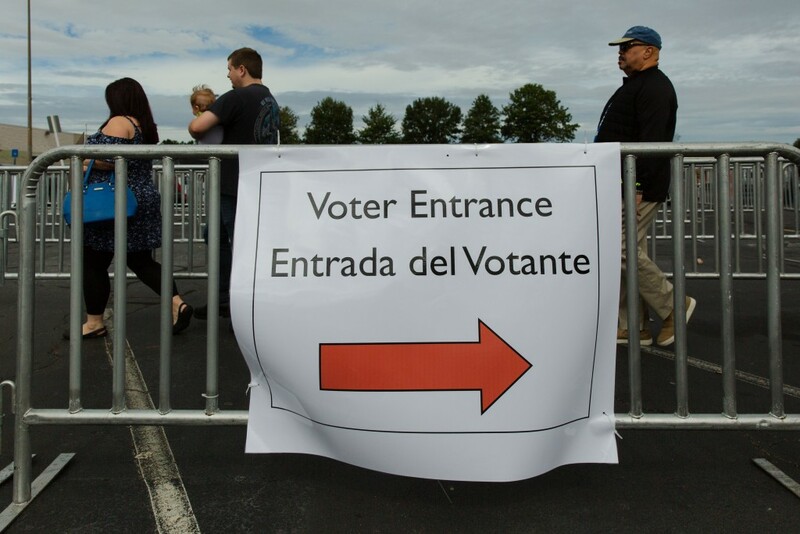 Signs in both English and Spanish hang on the walls as voters participate in early voting at the Gwinnett County Voter Registration and Elections office on Oct. 17, 2018. She clearly had more to say, so I motioned for her to continue. “If you’re a citizen of this country, you need to speak the language,” she said, pointing a finger at me. “You think if I went to their country and became a citizen, they’re gonna give me a ballot in English?” I asked if I could have her name in order to quote her, and she said she better not. After all, they both serve as Gwinnett County poll workers.